Does this can look a little puffy? The other day an Army “lifer” retired after forty years in the military. He celebrated by eating a tin of C-ration pound cake that he had gotten soon after his enlistment, back in 1969. I expected to read about his death by gastric explosion the next day, but he seems to have survived a can of forty-year-old pastry. Food additives were not a concern back then, so it probably had more preservatives in it than King Tut. The government must be more stringently enforcing regulations about product content and freshness now — at least, that’s what you’d think. 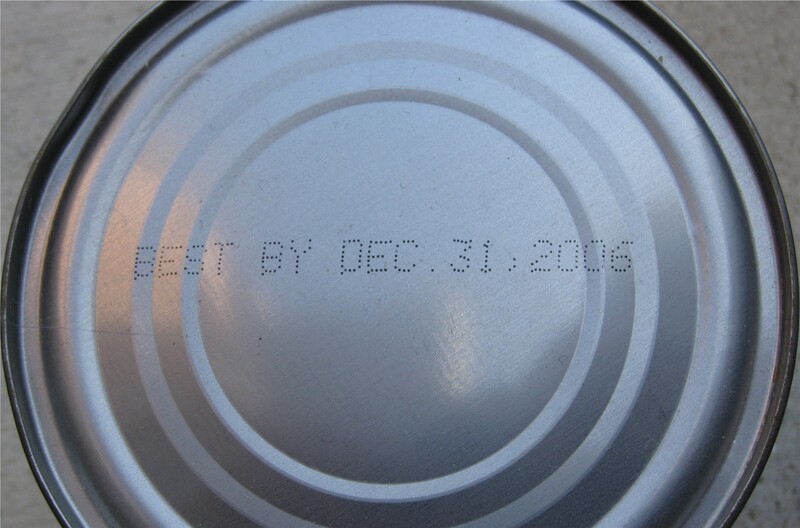 After all, virtually everything you might be inclined to eat or drink seems to have an expiration date stamped on it, right? I figured some watchdog agency of the federal government has determined how long it takes for tomato paste or peanut butter — even water! — to go bad in its container. Turns out I was wrong. Those date stamps are largely voluntary. Yes, the Food and Drug Administration does require expiration dates on infant formula and baby food. And yes, the Department of Agriculture has some strong opinions about when meat and poultry are, shall we say, un-fresh. Most states have laws concerning the stuff you buy, but those laws vary from state to state, and are usually about dairy products. Beyond that, it’s pretty much up to the discretion of the manufacturer and/or retailer. What we consumers call expiration dates mean something else to them. If you see a date stamp preceded by “sell by”, that tells the store how long to keep it on the shelf, and it’s a pretty good indicator that you shouldn’t buy the product after that date. It won’t necessarily make you sick, but it isn’t going to last a lot longer than the date shown. “Best if used by” simply means, well, what it says. The flavor or quality of that item is best by that date, but it’s still edible (or drinkable) after that. In other words, the “best by” date has more to do with quality than safety. That’s also basically true of the “use by” designation, which is the last date the manufacturer vouches for the product’s quality; they don’t want you eating their potato chips if they’ve gone stale. That’s because a bad experience might make you think twice about buying their brand of chips next time. It has the additional benefit, from the manufacturer’s point of view, of getting you to throw out food items that are still OK — and buy more of their product. It should be noted that unmarried men tend to ignore all expiration dates. In a bachelor’s cupboard you’ll find stuff (like cheese) that is even older than his toothbrush. Although a lot of these expiration dates don’t have the force of law behind them, I find them generally helpful. In fact, it might not be a bad idea to expand the use of expiration dates to other consumer products. Suppose they put them on clothing, for instance. Wouldn’t you like to know that those plaid pants you’re wearing have long since passed their “best by” date? Shouldn’t that woman at the end of the bar be notified that her hairdo expired in 1982? And I intentionally left out the question “How do you know when sour cream goes bad?” because that joke’s expiration date was years ago. This entry was posted in Uncategorized and tagged expiration dates. Bookmark the permalink. About that can in the picture… shall we use it tonight? You should be a part of a contest for one of the best blogs on the internet. I’m going to highly recommend this blog!